Yoshi performing an air dodge in Ultimate. 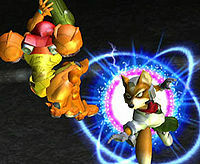 An air dodge (or EscapeAir by internal Brawl files) is a technique in Super Smash Bros. Melee, Super Smash Bros. Brawl, Super Smash Bros. 4, and Super Smash Bros. Ultimate that gives temporary intangibility frames to the user in the air, preventing attacks from hitting them. It can be described as spot dodging in midair. Fox air dodges to avoid Samus's Charge Shot in Melee. In Melee, an air dodge is performed by fully pressing the L or R button while in the air. Air dodges cannot be done if the character is tumbling or reeling. The air dodge halts the character's momentum; if the control stick is not tilted, it leaves the character hovering in place for most of its duration, and if the control stick is tilted, it gives the character a small boost in the chosen direction. This boost can aid one's recovery, though characters cannot grab ledges until the air dodge's animation ends. Furthermore, most up specials outreach the air dodge, making it more beneficial for getting back to the stage quickly from a short distance. After air dodging, characters enter a helpless state and fall to the ground. While air dodging, pressing the attack button while holding the shield button also allows the player to grab any nearby items, as well as use grab aerials with characters that have one: this is known as air dodge grabbing. Air dodging into the ground is known as wavelanding, which is the primary component of the wavedash. Real time animation of Mario air dodging in Melee. An angled recovery is the opposite of wavedashing, since the player angles the control stick up. An angled recovery is useful when a player gets knocked off a stage that has multiple platforms, such as Temple. In order to perform an angled recovery, the player must hold the control stick up diagonally and air dodge. The angled recovery has less lag time compared to a character's normal recovery, and it can't be negated as easily due to the intangibility it grants, but it generally doesn't go as far as a character's usual recovery move. The angled recovery is effective when the character's second jump isn't enough to make it back to the stage, but is close enough for where an air dodge will cover the remaining recovery distance. This can also be pulled off at far distances only if they're at a very high altitude. If the character is too far away, however, they will fall and self-destruct. While angled recoveries do not provide more height or distance than standard recovery options, they still see use by multiple characters in the cast. Jigglypuff, Yoshi, and a solo Ice Climber benefit from the tactic since their up special moves do not give any recovery distance, and in the cases of Jigglypuff and the solo Ice Climber, the air dodge gives more vertical distance than their side specials. In addition, while Samus, Link and Young Link boast relatively long and flexible recovery options, the angled recovery can allow for the trio to use their wall grapple during the ascent of the dodge; as players can air dodge in any direction, it can also be used to get the character closer to the stage in order to decrease their distance from a wall. Outside of this, most of the cast may elect to use angle recoveries in order to combat some edgeguard techniques that do not include edgehogging; air dodging into a ledge, for instance, can counter a player who is charging an attack on the edge of a stage. Grabbing the ledge is possible as soon the animation length is over. 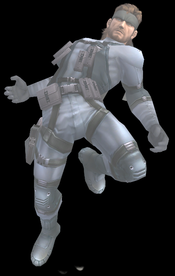 Snake performing an air dodge in Brawl. In Brawl, the air dodge has been revamped. It no longer halts the character's momentum and no longer permits the user to nudge the character by pressing the control stick; it simply grants brief intangiblity along the character's current line of movement. Following the air dodge, characters are put in their regular aerial state rather than the helpless state, and thus may attack, jump, or air dodge again following their initial air dodge. The air dodge can now also be used when a character is tumbling or reeling, and with the introduction of hitstun canceling, characters can air dodge out of these states 13 frames after being hit, regardless of the amount of hitstun received. This is often employed by players to enable action quicker than waiting out their knockback and to limit reliance on teching. Using the air dodge at this time does not reduce knockback, a rumor that was started when it was noticed that higher-level CPUs were doing it constantly. However, an air dodge can be used for momentum canceling, and in some cases, such as Ike and Snake, it is their best option, since they yield better results using an air dodge when momentum canceling than their shortest-lasting aerial (both of their air dodges end in 39 frames, while their shortest-lasting aerials last just a few frames longer, and despite the minuscule difference, air dodging is still their best option nonetheless). In addition, they also gain the most benefit when momentum canceling using the basic method. Air dodges now cause characters to automatically catch any item nearby during the first frames (unless they are holding one already), without having to press the attack button like in Melee. However, this also means characters can no longer grab items at any time of the air dodge, only the beginning. The table here displays the frame data for the air dodge of every Brawl character. Every character has a certain amount of frames taken to perform an air dodge, and the intangibility frames starts and ends in between the total frames taken. Most characters' intangibility usually starts on frame 4 and end about 10 or 20 frames before the end of the entire air dodge; however, there are a few exceptions. In Smash 4, air dodges have significantly less ending lag, now lasting from 28 to 34 frames (depending on the character, with only Bayonetta's air dodge lasting a longer time of 36 frames), compared to the previous games' 39 to 49 frames. This allows characters to execute many air dodges in quick succession to avoid attacks, as well as safely use attacks out of them; players can now jump, go through an opponent's attack with an air dodge, then retaliate with an attack or their own. This is especially beneficial for characters with quick aerial attacks, as they can do them along with an air dodge in a short hop. Jigglypuff also finds easier opportunities landing its Rest in this way. However, air dodges now produce a significant landing lag of 21 frames as the character lands with an air dodge active, even during vulnerability frames, making air dodges easier to punish on land, and thus riskier to use close to the ground. To prevent this, some characters can use an aerial attack in order to replace the air dodge's landing lag with the aerial's autocancel, a technique known as "dodge cancelling", though this requires precise timing. Some characters can also ledge cancel their air dodge to avoid significant landing lag. Unlike in Brawl, however, it isn't possible to cancel hitstun with an air dodge until the receiver takes 41 or more frames of hitstun (often between 80 and 90%) - resulting in combos being easier, but safe juggles being more difficult to pull off. Both the shield button and the grab button (when used in midair by a character without a grab aerial) allow players to air dodge. In past installments, the grab button would cause the fighter to use a neutral aerial. The table here displays the frame data for the air dodge of every character in the current version of both Super Smash Bros. for Nintendo 3DS and Super Smash Bros. for Wii U. Before version 1.0.4 of Smash 3DS, Wii Fit Trainer had only 12 landing lag frames from an air dodge, while Zero Suit Samus had 15; these were later changed to the standard 21 frames used for all other characters. Pac-Man's air dodge in Ultimate. Air dodges were revamped once again in Ultimate, containing elements from all previous air dodge systems. Characters can do a neutral air dodge similar to Brawl and Smash 4, or a directional air dodge similar to Melee, depending on whether the control stick is in a neutral position or held in a direction. Air dodging also has significantly more ending lag compared to Smash 4 (with an average duration of 49-50 frames for neutral air dodges, up from 32-33 frames, and all directional air dodges having more than a full second of duration), and can only be done once until the character lands, gets hit, or grabs a ledge, regardless of the type of air dodge used. Furthermore, like rolls and spot dodges, air dodges are affected by a staleness mechanic that decreases their intangibility frames if any kind of dodge is used repeatedly. However, neutral air dodges grant slightly more intangibility (two additional frames for most characters) and have effectively halved landing lag (10 frames, down from 21 in Smash 4), making them safer to land with. The staleness mechanic also does not increase the duration of air dodges, unlike rolls and spot dodges, though it does reduce the distance granted by directional ones. Directional air dodging, while being similar in concept and execution to Melee's air dodges, has several differences. It does not cause helplessness, instead having significant ending lag (alongside only being usable once per air time as aforementioned), and offers a significantly bigger momentum boost, while allowing characters to grab edges much earlier, aiding in recovery more efficiently. Additionally, it does not completely cancel previous momentum, and when air dodging in a certain direction, characters will first shift a small distance towards the opposite direction (such as left and upward if it was aimed right and downward) in a slingshot fashion. Furthermore, landing lag for directional air dodges is higher, and increases the earlier the character lands after performing them, having from 11 to 19 frames of landing lag. The drastic changes to air dodges significantly weaken them as a defensive option, as characters can no longer air dodge attacks multiple times in midair, nor quickly strike back at opponents with their own attacks after an air dodge. This also makes them much harder to use offstage, with directional air dodges in particular often guaranteeing a self-destruct if the player uses them at any height below the stage. As a result, aerial pressure (such as juggling) and offstage edgeguarding are generally more commonplace than in Smash 4, with options to negate them being more limited. However, due to their lower landing lag and the directional version's ability to grab edges faster, air dodges are more effective as a recovery mixup and for getting out of disadvantageous positions if used during the right circumstances. Moreover, characters with recovery special moves that do not cause helplessness, such as R.O.B., Snake and Sonic, or grant little distance, such as Jigglypuff and Yoshi, benefit from the reintroduction of air dodges, as they can achieve longer distances at their fullest recovery potential. Overall, air dodges remain useful, but their reckless or repeated use is much more discouraged, instead rewarding players that can use them at opportune moments. With the reintroduction of directional air dodges, wavedashing can once again be performed, alongside wavelanding. However, due to their new slingshot properties, which prevent characters from landing with them immediately after leaving the ground, as well as their higher landing lag and the increased traction across the cast, wavedashing has lost nearly all of its utility for approaching and spacing. Air dodges can also no longer be ledge canceled, hindering wavelanding mixups. In addition to playable characters, several Assist Trophies have gained the ability to perform directional air dodges, making it more difficult for players to KO them. Unlike in previous games, where the duration of each character's air dodge was arbitrary, air dodges in Ultimate have their durations sorted across the cast so that every character falls approximately the same distance when air dodging. As a result, characters have shorter air dodges the higher their falling speed and gravity; following this correlation, Fox has the shortest one in the game, whereas Jigglypuff has the longest one. Likewise, directional air dodges have a longer duration if angled upward, and a shorter duration if angled downward. Directional air dodges grant less intangibility than neutral air dodges, and both types grant intangibility three frames later if fully stale. Regardless of staleness, all characters can grab edges after the first 24 frames of their directional air dodge, resulting in most of them being vulnerable for only 3 frames if they grab an edge as soon as possible, discounting the 2-frame vulnerability period. *Bowser Jr. is unique in that after using Abandon Ship!, he possesses a different air dodge that is nearly identical to his Smash 4 one, except it grants two more intangibility frames and cannot be used more than once. This effectively gives him the fastest and overall most effective air dodge in the game, but only under a specific circumstance. Much like Smash 4 air dodges, it is not affected by the dodge staleness mechanic, and its use does not contribute to it, but it lacks a directional variant. Additionally, as an accidental carryover from Smash 4, this air dodge could be used multiple times without landing or getting hit prior to version 1.1.0 of Ultimate. All characters receive the same amount of momentum from their directional air dodges, with the exception of Lucas and Ness, who receive more, and Bayonetta and Little Mac, who receive less, the latter receiving the least momentum out of the cast. As a result, the former have better opportunities to escape juggles, and when close to an edge, can use their air dodges for recovery as a more reliable alternative to their up special, which can be easily interrupted by opponents. Conversely, the latter are more vulnerable to juggling and cannot avoid edgeguards as effectively by air dodging to the ledge; while Bayonetta benefits from directional air dodging regardless due to her recovery special moves not causing helplessness, Little Mac is noticeably hindered in comparison to the rest of the cast, especially given his infamously poor air game. All directional air dodges have their distance reduced by roughly 33.3% when fully stale. This page was last edited on February 14, 2019, at 00:50.